Finally Available ! You wouldn't believe the strength of this device. All You Need is a Spare USB Port for it to Work That's it !! 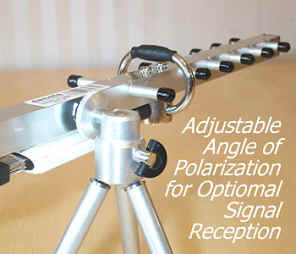 Tripod capable of Vertical or Horizontal antenna operation. How it Works !! You don't need to buy expensive Type N or Pigtail Cables, Adaptors + Wifi Card to make it work. This is a Complete plug and play system. Just plug your Antenna into your PC or Laptop via the USB Cable. The Built-In WiFi Card on the antenna is connected directly to your PC like a Wifi Card inside your computer, this mean you get 100% of the signal. This brand new field proven USB- antenna is equipped with the high performance 802.11b/g USB2.0 WiFi dongle that comes with a 3 meters USB2.0 cable (optional 5 metes USB2.0 cable available) as a complete kit. Instantly improves your computer's WiFi reception capability beyond the built-in standard factory gear. It works within minutes. Simply plug in the USB cable of the USB- antenna to your laptop or desktop PC and follow a few simple clicks for CD-ROM driver installation - There is no need to worry about the cable compatibility issue. This antenna delivers a remarkable +28dBm horse power in the direction it is pointing with a HPBW beaming aperture of 30 degrees and provides sufficient waveguide runway for ultimate beam focus, resulting in penetrating of concrete walls to improve signal strength and quality and is precisely engineered and manufactured to provide the optimal performance, and it looks good ! Lost your CD ?? Computer Crashed ? ?